People of Japan are so daring! hmm, so far the Toyko looks leave something to be desired. I hope truly stylish people will be photographed soon… The guy with yellow hair looks horrible! Wow Scott, I made a pink post for as well !!!! Love the colour.Nothing like bright people shining like beacons in an otherwise dull and dreary world. Incredibly individual style . . . at least when compared to the U.S. 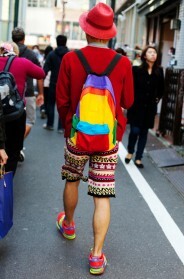 In japan you find the best personal style, everyone dress different, nobody cares what people think, it's awesome. Scott, Will you visit Harajuku? People is crazy there. love that girl's Flintone-esque dress. 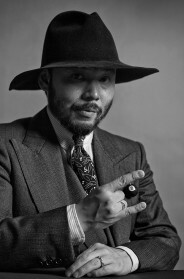 Great pics and i love tokyo fashion. Sizzles REAL hot, liking the HEAT. Love pink, especially in the first photo! ROCKIN. oh love her vibrant yellow hair as the counter point to the pink! The coat on the third photo, I'd buy it and wear it just like that. I love it. oooo would love to hear your thoughts about the Japan experience. :) again, thanks for the multi-photo post! Sugoi! ur camera must b going crazy! so much to shoot,love how the japanese put together clothes! Love pink! Love colours! Just had my nails paited pink also… Love the hat on the third picture, just great! Liz B, São Paulo, Brazil. loving the jeremy scott tunic on the guy in that first photo! and the Docs…. que magnifique! Amazing photo's. Love the contrast and the daring mood in them. Love the pop factor of Japan, I wish NYC could be a bit more vibrant. Japanese style is becoming a parody of…Japanese style. Seems a bit affected. she really nailed the whole look! Fantastic. I cannot wait to get back to Japan. Also, maybe someday I'll feel comfortable enough, and non-self-conscious enough to dress like that. i'm in complete and utter head-to-toe love with the last snapshot. i mean LOVE. Love the hair and love the watch fob thing! When do we get to know details on your United Arrows events? In a city of over 20 million people you have to be bright and different to stand out from the crowd. 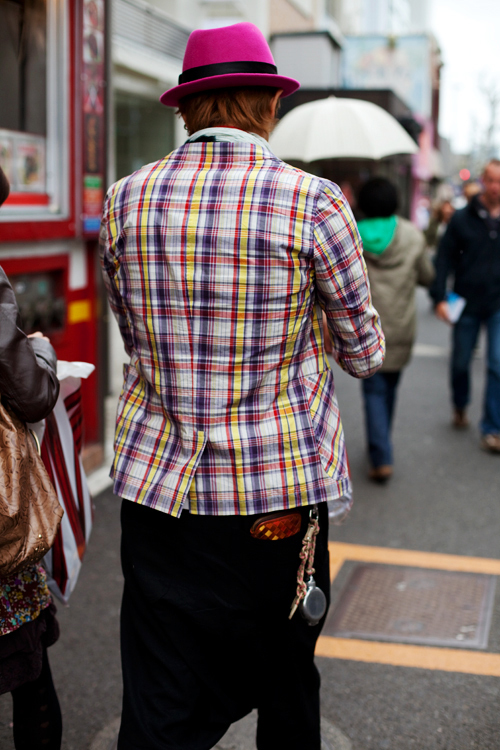 If you really want to see some different styles, then take a trip to Tokyo for a real eyeful. I´ve been here In tokyo for some time. Ar first it´s exciting but then everybody start to look the same. It´s too much!You can´t see the woods from the trees. But now and then I come across somebody really unique in the most unexpected places. Girl? looks like a boy to me. So, you're in Tokyo! ^o^!! Welcome! WOW!!! Pink makes me blush, and the hair in the first photos is kind of cool! How incredibly fun! I cannot WAIT to get myself to Japan. WOULD GIVE ANYTHING TO SEE THE FULL OUTFIT OF THE GENT IN THE THIRD PIC. LOVE THE COLOR AND PATTERN COLISION OF THE BLAZER AND HAT. That girl with the lime-yellow hair is fab! To the Photodiarist and Anonymous 8:24 pm: what exactly are you talking about when you complain about American style being bland and conformist – have you actually paid any attention whatsoever to the thousands of photos of stylish Americans that the Sartorialist has posted on this site over the last few years? Are you even aware that the Sartorialist himself is an American? I'm tired of these kinds of cultural stereotypes about America, or about any other country for that matter. Why can't we just enjoy the great style of the Japanese without also having to use it as an occasion to bash the style of the Americans? Anyway, the Japanese style is great. I've been there twice, and have enjoyed observing their aesthetic sense every time. The Japanese are particularly adept at mixing patterns and colors in unusual ways – a custom that goes back in their history almost a thousand years to the time of the imperial Heian court when noblemen and noblewomen would spend hours arranging their many layers of kimono to create subtle and sophisticated color and pattern combinations that would communicate their mood, character, position in society, etc. I'd like to thank the Sartorialist for posting so many photos from Tokyo even in the midst of his jet lag, and for giving us all such a great blog to enjoy. Many thanks! love the pink popping through! great colour for a rainy day! I agree with Marie EI, after a while they all start to look the same. Looking in from america, or any other country you may be tempted to think how daring and different they are dressing… they aren't really.. They dress according to what group they fit into. Japan is SUCH a group culture and you MUST fit in. That being said I'm so glad your hear and can't wait to see more pics!! Just like anywhere there are some truly unique and wonderful styles! This is amazing! That yellow hair is spectacular. Love these fluo colors! Amazing and cool pics! The guy in the pink hat, I love the detailing and how he match the jacket, wallet and knotted rope holding the grandpa watch. Very clever. I think the hair is what stands out most. What a crazy color! I just walked by the pop-up shop. I hope today's light is better for shooting. Shame it's going to be raining for a bit. Looking forward to your next finds. It's great how you're adding more picture of the objects and scenery of the places you're visiting. You have such a unique perspective on the things that make up the places as much as picking the right people that inhabit them. you might have equally commented on the technicolour hair. Well done for avoiding the prosaic Harajuku shots. Japan seems to be a fashion world on its own. I remember hoards of Japanese tourists coming to Paris to buy over-sized Chanel suits in the most garish colours during the 1980s. No-one would have dressed like that outside of Japan. I think this is entirely positive. The world is in some respects becoming too homogeneous. I love pink but I would not wear so bright a shade. However, it is great that there are different fashion trends, styles emerging everywhere in the world! Japan has produced its fair share of great designers in the past decades. No doubt this is partly due to their idiosyncratic visual culture! I love her yellow hair..so cool..! I like the non fashion photos that you load up.Please,continue! Too pop and strident for me.It reminds me the work of the painter Murakami Takeshi(not to confuse with Murakami Haruki,the writer).I usually don't love pink(only Yves Saint Laurent could convince me). Ah, Japan is so special ! It's realy peculiar. I think now I want to go over there. I'm ready. But it took time (next opportunity…). I think it has always been a very sophisticated culture. It's frightening in a way, but attractive at the same time. Japanese people can be very daring but they also can have very rigid codes, that are very hard to understand for a foreiner. That's also why they have such exentric people : it's a big step to break thoses codes. I hate to not join the hot-pink-loving bandwagon but…all of these seem just so gaudy. Walk into an American highschool and you could find girls that dress exactly like the first. 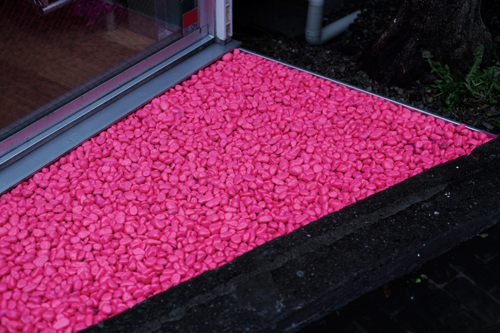 Hot pink pebbles? Look in the fishbowl. The hot pink fedora is pretty great though. Not a fan of the plaid jacket. he's a boy, not a girl. in my opinion, line between gender becomes blur in Asia. im nearly 99% certain the first one is a boy… perhaps you could clarify, Mr. Sartorialist? and I would just like to point out that the stlyish are most definitely in the minority in every country based on my experience.. with the possible exceptions being the italians. the guy with pink top is adorbs! he definitely belongs on the flintstones!! Sorry, that pink and yellow combo is just weird looking to me. Call me old fashioned. Loving these new Tokyo pictures. Finally you are back to what you do better! Real stylish people and not people that work in fashion! like some people have commented, Japanese style can be unique. The great thing is that in Tokyo basically anything goes. HOWEVER, most of the people walking the streets are like sheep following the latest fashion trend to the letter. Take a spring trend like floral patterns: it is everywhere. Young girls start looking like cut-outs from magazines. The only place that you can usually find unique fashion is the Harajuku/Ometesando area because it is known to be unique and fashionable. This is like a jolt to your system. Keep them coming Sartorialist! he looks like a flinestone! love his hair!! The flintstones shirt is by Jeremy Scott, no? Whimsical yet chic – love it. I love seeing that others are rocking this pink color, i recently noticed my obsession for pink, whilst a lot of trend followers here in New zealand are wearing autumn to winters black and whites, it's apparently in at the moment.so i went to the trouble of home dyeing a couple of my items flamingo pink. These tokyo men's style are funny. especially the green hair men. i would have loved to visit your booksigning however, living in not japan does cause some problems. as a half japanese girl i am delighted that these amazing looks are posted on your site, and have seen the indie japanese fashion rather than the classic looks that have previously been seen on your site. Yuki said: The great thing is that in Tokyo basically anything goes. HOWEVER, most of the people walking the streets are like sheep following the latest fashion trend to the letter. Very interesting thing to know. It sounds a bit similar to London. In London, anything goes because people basically ignore each other. Everyone belongs to their own bubble. Say, a "punk" is in his own bubble, the punk bubble and will follow to the letters the dictates of that punk bubble (these dictates were mostly established 35 years ago). At the bus stop, there can be a man dressed very conservatively because his bubble is "the City of London" (the financial centre). The fashionista bubble is another one, as is the indie bubble (the one usually favoured by facehunter). I love every photograph in this series. There is definitely something retro in the air here. Hot Pink Doc Martins? I love this! These young people are so bold and absolutely fearless with their self expression. Nice to see. Haha love it! You can always find interesting styles on the streets of Japan. Little pops of color. Lovely! I love the humor and I'm glad someone found the muscle tank from jeremy scott worth 205$. The first guy it's amazing! that shirt is amazing. love it! Love people not afraid to stand out. Thought Pebbles Flintstone as well, then scroll down to find… pink PEBBLES! Love it!